Neanderthals have a reputation as grunting dimwits who lived animalistic lives in caves. But modern scientific discoveries have changed this picture dramatically. The latest discovery to overturn this myth offers evidence that Neanderthals painted shells like this one, and kept them as art or jewelry. Anthropologists have made several finds in recent years that reveal how Neanderthals made shell art, and that they may have buried their dead with ceremonial objects. But the problem is that we have found so few materials left by the Neanderthals who lived in Europe from roughly 350 to 40 thousand years ago. Much of what we do know comes from late in the Neanderthals' reign, at a time when they would have shared territory with early Homo sapiens. And it's impossible to say whether artifacts from this period were made by Homo sapiens or Neanderthals — or even by Neanderthals influenced by Homo sapiens. It was smeared with a pure, finely ground, hematite powder, probably mixed with a liquid. It was perhaps perforated and used as a personal ornament before being discarded, lost or intentionally left at Fumane Cave." That the pendant appears well before the presumed first appearance of AMH in Europe indicates that Neandertals made this art object without the influence of AMH. 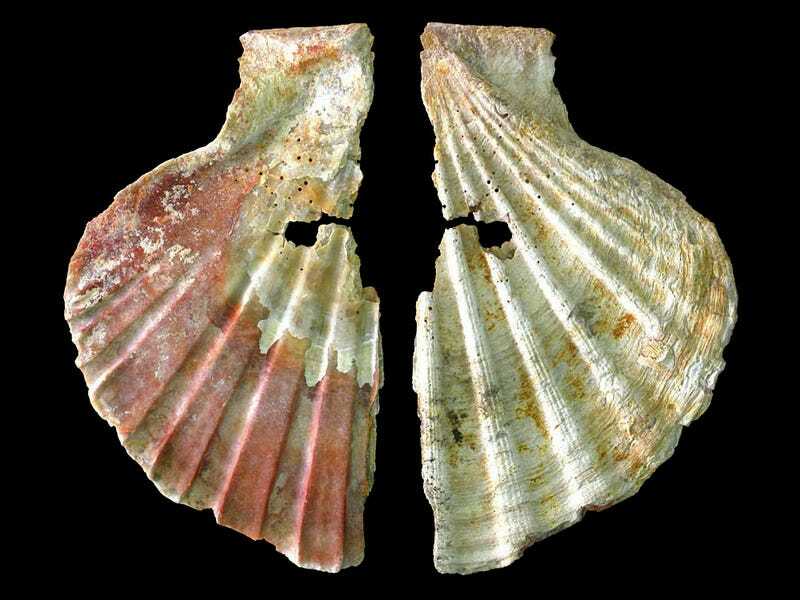 The use of this shell by Neandertals as a result of contact with immigrant AMH is also contradicted by the absence of this particular taxon of shell at Early Upper Paleolithic sites across Europe. The only other Paleolithic occurrence is a specimen found in the Epigravettian horizons of Riparo Tagliente in the Lessini Mountains of NE Italy. Thus, this discovery adds to the ever-increasing evidence that Neandertals had symbolic items as part of their culture. Future discoveries will only add to our appreciation of Neandertals shared capacities with us. So it appears that when Homo sapiens met the Neanderthals for the first time, it would have been more like a meeting between two groups of humans than between humans and animals.